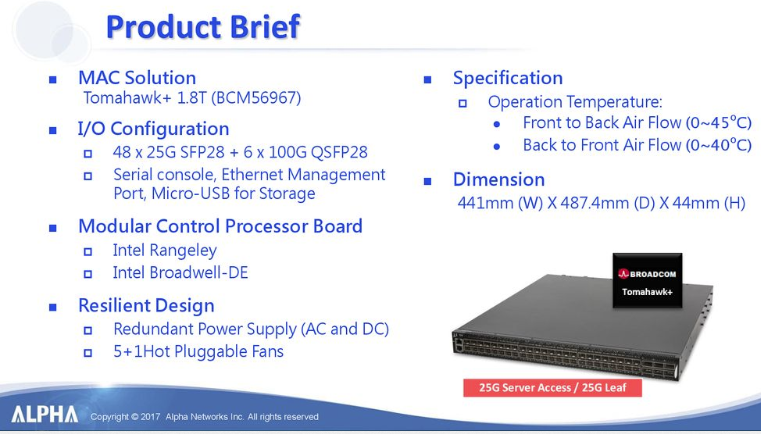 In a slide deck at OCP, Alpha says this is a Tomahawk+ BCM56963. It has been submitted to OCP. The ASIC designation also say 1.8T. This is much less than the 3.2 T that Broadcom listed in the BCM56960 Tomahawk data sheet. Here 48 x 25 + 6 x 100 = 1.8T. What is not clear is whether the number of switch cores has been reduced. And how would that affect buffer per core? It is also listed as Tomahawk+ in the slide show presentation to OCP when four switches were submitted for standardization. The BMC in the green box is a controller that runs the fans, temperature sensors and LEDs.